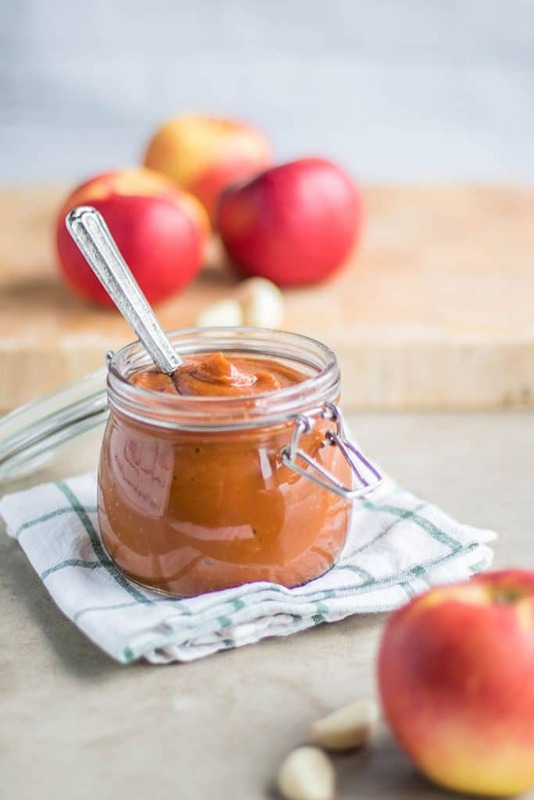 This Sweet Onion Apple BBQ Sauce is the perfect recipe to end summer and welcome fall. 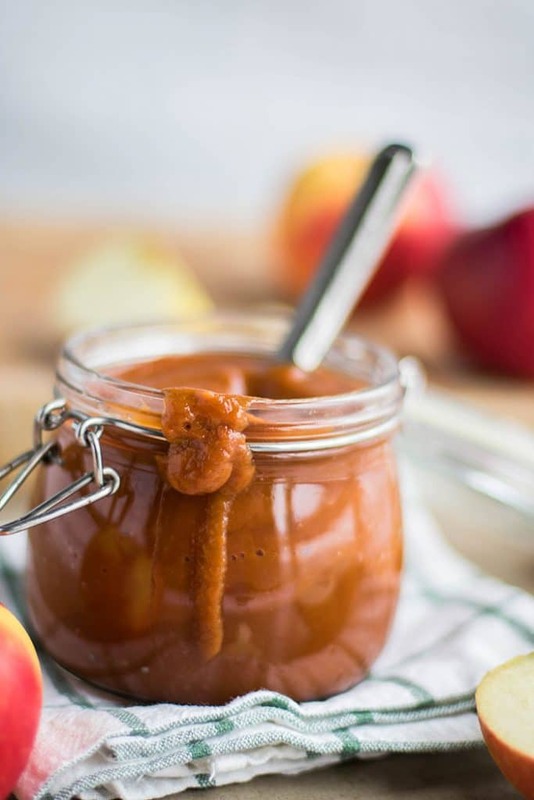 Apples are slow cooked with cinnamon sticks, and then pureed with caramelized sweet onions and tons of spice to make a sweet and rich but low in sugar BBQ sauce. My little one is 2 years old this week. When planning his birthday party, I went straight to Pinterest to get ideas for a party theme, and when I saw a “Chugga Chugga Two Two” sign, I knew exactly what my “choo choo train”-loving son needed. When it came to the food for his party, no Pinterest needed. That’s an area I feel fully confident in. I thought making hot BBQ chicken sandwiches in the slow cooker for people to assemble would be a great summer picnic meal, but I hated the idea of pouring sugar on our food, especially knowing there would be other treats and cake, and lots of toddlers who don’t need to be jacked up on sugar to run around in circles screaming. They naturally have that energy, and giving them more just isn’t necessary! A few years ago, I made a Watermelon Barbeque Sauce. The fruit made the sauce so sweet, I was able to get away with just a bit of molasses and came out with a wonderfully sweet sauce. It’s August — still full on summer — but I, like many food bloggers, get excited for fall foods as soon as the calendar turns to August. Apples, pumpkins, spices — really the best food season (wait?! What about berries and watermelon and peaches? SO HARD TO CHOOSE!). I added caramelized onions to the first batch, and it was good, don’t get me wrong, but it wasn’t quite there yet. Back to the store, and I found these giant sweet onions. I knew that adding more onion, and one as deliciously sweet as this one, would be the key to adding more flavor to my sauce. 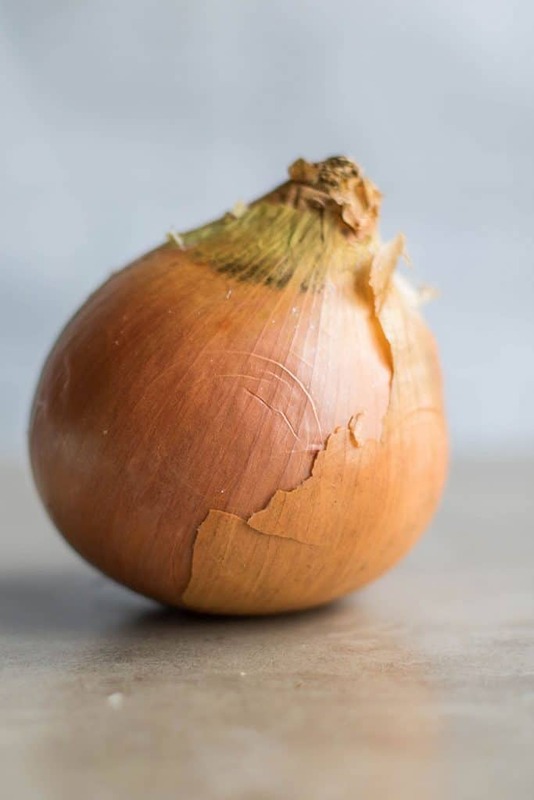 I encourage you to go buy whatever sweet onions you have in your area– Vidalias, Walla Walla Sweets, delicious! Not a typical “fall veggie” to look forward to, but this recipe should have you out onion shopping in no time. Buy fresh local produce! Use whatever sweet onions are available in your area this time of year. I used Pink Lady apples, but Honeycrisp or Gravenstein would be great as well. Make it Ahead: This sauce makes a large batch, and freezes wonderfully. I am going to share a recipe with it next week, so go ahead and use half and freeze the rest for then! This is the perfect recipe to end summer and welcome fall. 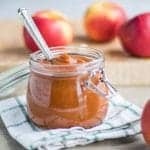 Apples are slow cooked with cinnamon sticks, and then pureed with caramelized sweet onions and spices to make a sweet and rich but low in sugar BBQ sauce. Peel and slice the apples. then put in the slow cooker with 1 cup water and cinnamon sticks. Cook on low for 4-6 hours. Add olive oil to a frying pan over medium heat, and add chopped onions and garlic. Saute, lowering heat if necessary, for about 20 minutes, stirring to ensure even browning. While the onions are cooking, add the rest of the ingredients to a blender, along with stewed apples, removing and discarding cinnamon sticks. When onions are caramelized, add them to the blender, and blend on high speed until the mixture is very smooth. Taste, and add more salt or cayenne to taste. *Nutrition facts are for 1 cup of sauce. A serving of BBQ is closer to 1/4 cup. Having an Apple Peeler, Corer, Slicer makes homemade apple sauce and other recipes so much easier! 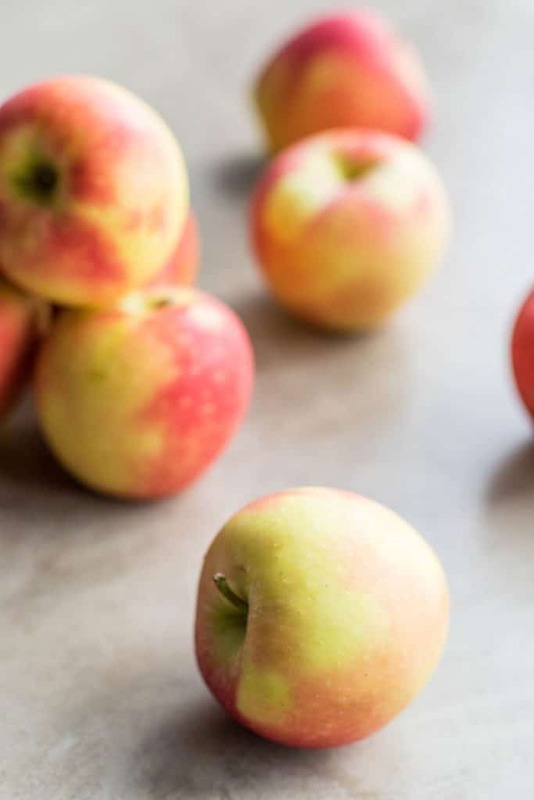 Usingthis, you can peel and chop your 2 1/2 pounds of apples in 2 minutes instead of 20! I love little kitchen contraptions like this that make healthier cooking faster.